"The Bargain Store, Mahnomen County, Minnesota"
Frank W. Rumreich continued to operate the store until his death in 1922. At that point, Frank's oldest son, Felix M. "Tubby" Rumreich (then 17), took over the business. The newspaper below was from this period. What is Chipso? As the early years of the 20th Century progressed, the invention of the washing machine was replacing the old fashioned and exhausting method of washing laundry by hand. To go along with the modern times, Procter & Gamble created Chipso, the first soap brand specially made for washing machines. Instead of using a grater to create chips from a bar of soap, all was needed was to open a box of Chipso and pour the chips into the wash water. This was wonderful news for fingers that would otherwise risk being injured on the unforgiving soap grater. Webmaster's Note: In the 1940s and 50s my mother was still making homemade lye soap. She saved the cooking fat all year and made soap in the summer, letting it cure in shallow, newspaper-lined wooden boxes which once held fruit. When it was cured, she cut it into blocks for storage. She grated it to use for washing dishes and clothes and we used the blocks for handsoap and baths. We brushed our teeth, however, with baking soda. 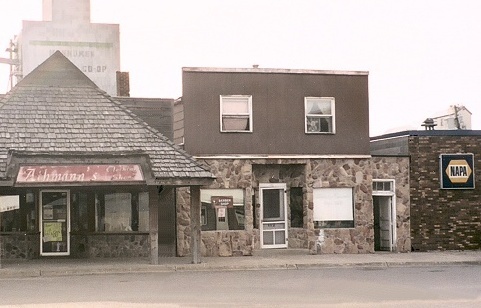 The store became known as "Tubby's Grocery." In 1928, the store was expanded by converting the warehouse to a part of the main store, adding nearly fifty percent to the floor space. Felix operated the grocery until his death in 1967. Former location of Bastyr & Rumreich (later Tubby's) Grocery.